It is not clear yet how many workers have been murdered in the mining disaster in Soma, Manisa in Western Turkey. At the time of writing the official death toll stands at 304 though workers in the town claim that they are being lied to about the numbers, and many more have been killed. What is clear is that it is not true that “these types of incidents are ordinary things" as Prime Minister Erdoğan is suggesting. He made a great show of in the immediate aftermath of these terrible events of demonstrating his knowledge of the history of disasters in the mining industry, stretching back to Northumberland in the UK, and placed particular stress on those that happened in the US, a country which has, to quote Erdoğan again “every kind of technology”. The implication, of course, is that these sort of things just happen, they happen everywhere, and they can't be avoided. This is not the case. Accidents are endemic in coal production because of the drive for profit. The Turkish mining industry has always been infamous for its accident and death rate, and since privatisation in 1984. Alp Gürkan, the CEO of Soma Mining Inc, the owners of the mine, has been claiming this week that “We have spent our income to improve working conditions to avoid possible accidents”, but not so long ago, he was boasting in the media how that before his company took over the Soma mine coal used to cost $130-140 to produce, and that now it costs $23.80 to produce “thanks to the operation methods of the private sector”, which have included cuts in safety precautions, a highly unpopular casualisation of the work force, and buying cheaper locally produced equipment, such as transformers, which were previously imported .According to early reports, it was the explosion of a transformer that set off a chain reaction that led to the Soma mine being filled with suffocating gases..
Turkish mining has an absolutely appalling safety record. The coal industry accounts for just over 10% of industrial accidents, with 13,000 miners involved in accidents last year. Since the year 2,000, 1308 people had died in coal mining accidents prior to these latest events. All this makes Turkey the country with the highest number of mining fatalities in the world after China. However, these figures are deceptive, and when the details are examined, Turkey has a death rate per million tons of coal production of 7.22 workers compared to 1.27 in China and 0.02 in the United States. What this actually means is that workers are nearly six times more likely to die in a Turkish coal mine than a Chinese one, and 361 times more likely than US mine workers. That said, it is unsurprising the Erdoğan's statement that "Explosions like this in these mines happen all the time. It's not like these don't happen elsewhere in the world” was met with anger and disdain by mineworkers in Soma. 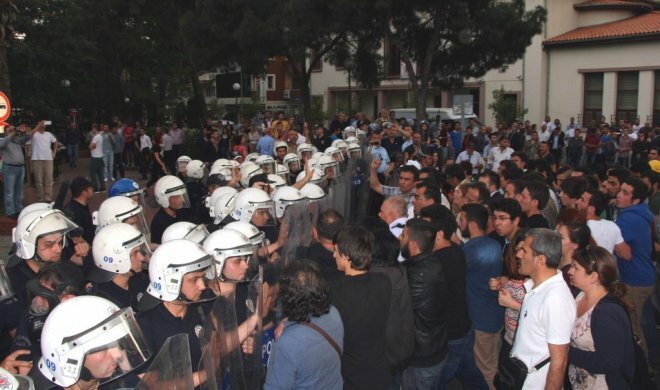 Erdoğan proclaimed that there would be three days of “national mourning”, but for workers in Soma this has meant them being attacked by water cannons and gas. The government also added a personal touch to all of this, with an official from the Prime Minister's office, Yusuf Yerkel, being photographed kicking a relative of a dead miner, and the Prime Minister himself being reported to have hit somebody too. The offices of the ruling AKP in the town were smashed. It was not only workers in Soma who are very clear about where the blame for the disaster lies. Demonstrations quickly spread across the country, and on all of them there were banners proclaiming that it was not an accident, but murder, and that the government was responsible. Demonstrations took place almost immediately all across the country. On Wednesday night, large numbers of people were confronted by police with water cannon, and gas guns, in Taksim square, the centre stage of last years protest movements, as well as in Ankara, and Izmir, and other big cities. Thursday saw a one day general strike called by the left-wing trade unions, DİSK, KESK, TMMOB, TTB and TDB. The main trade union confederation Türk-İs called for a three minute strike. Angry workers, and students in Ankara attacked, and occupied their offices in response. The strike seems to have been the largest general strike in Turkey for decades. Usually general strikes tend to involve somewhere around half a million workers from these left wing unions. The strikes yesterday went far beyond this, with hundreds of thousands of factory workers, from places where DİSK doesn't have a presence, joining in with the strike, and the protests, and not only for three minutes either. Amongst the strikers were workers in the infamous Tuzla shipyard zone, where over 200 workers have died in industrial accidents in the last three decades. The government seems to be in no mood for taking a conciliatory attitude to strikers, with around 10,000 striking coal miners in the Black Sea province of Zonguldak being docked two days pay despite only being on strike for one day. Incidents like this seem designed to antagonise workers further, and some demonstrations by workers have continued on the day following the strike action. All this two weeks before the anniversary of the start of the Gezi protests suggests that there could well be further struggles in response to these murders and the state brutality that has accompanied it. What a clown Erdogan is! Accidents like this happen all the time he says, before taking refuge in a supermarket from the angry response he got. Yes of course accidents like this happen sll the time, because capitalism is a murderous system that doesn't give a bugger about those it exploits. Those it lives off are supposed to shut up and just slave away quietly. If they get killed while working well hard luck for them and hard luck too for the bourgeoisie too who have to find replacements. But cheer up Erdogsn and cheer up bourgeoisie, new workers are easily found in times of high unemployment, and folk, driven to extremes, will almost work for nothing under the compulsion of needing to be fed from time to time. In fact, most folk these days do more or less work for nothing, so well done bourgeoise you've got it made! Your profits are safe. And even those workers who don't get killed or injured on the job may very likely get beaten up by the police or shot (by accident of course) while striking or demonstrating, so that helps keep down the numbers of scroungers and trouble makers. And then there's the new ploy for our rulers of docking two days pay off those who've been on strike for just one. That's fun isn't it. That'll teach the blighters a lesson, and keep them cowering in their rat holes. But wait. This magnificent blow of misery seems to have gone wrong! The workers have been pushed too far: they are antagonized! Who would've believed it possible? Will they strike back? Have the bourgeoisie just made things worse? Erdogan'll be heading for a local supermarket refuge again. Let's hope the workers find him. Maybe he'll get a kick or two. So, finally. All power to the Turkish workers, and workers everywhere. Don't give up. Fight on. Down with state terrorism and murder. Down with all bourgeois states. Long live the proletarian revolution. And thank you comrade Valerian for your enlightening article.